OXFORD, Miss. – Having swept the No. 16 Florida Gators last weekend, followed by a sound defeat of in-state rival Southern Miss, the Rebels entered the series with Kentucky on a five-game SEC winning streak. Kentucky began the weekend at 18-15 overall, 2-10 in SEC action while Ole Miss came in at 24-10 overall and tied for first in the SEC West at 8-4. Click here for box score. Junior starter Will Ethridge dazzled through seven shutouts innings Friday night. The Ole Miss ace held the Wildcat hitters to just three hits and allowed no walks. He threw a career-high 11 strikeouts and improved to 5-2 on the season. 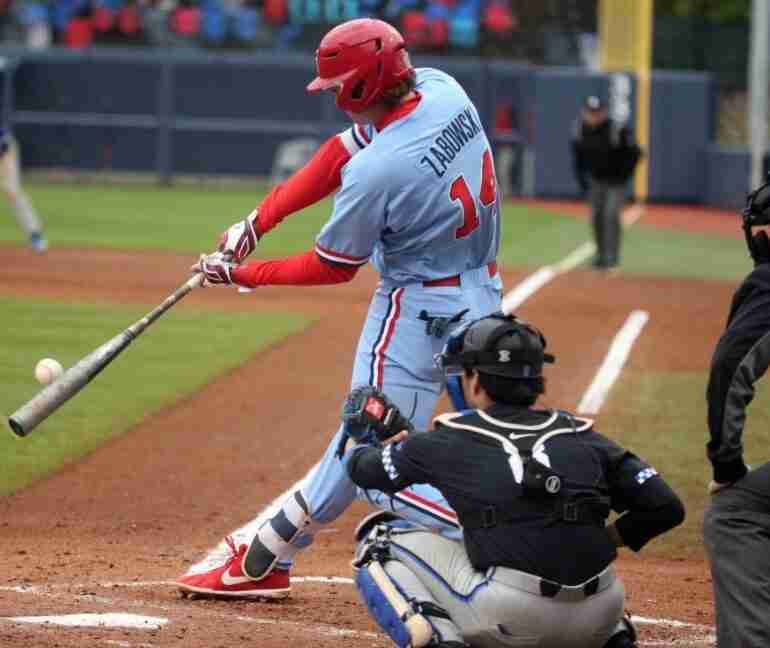 (Ethridge) had all three pitches tonight,” head coach Mike Bianco said. “…Really, really, good fastball with so much movement…just dominant,” he added. That is strikeout #10! @willethridge_20 throwing 🔥 out here as he ties his career-best! Ole Miss got on the scoreboard early off the bat of DH Cole Zabowski. His opposite field home run in the first inning—his eighth of the season—scored Grae Kessinger and Thomas Dillard. “Z-Bo just crushed that ball,” Coach Bianco said of the homer. The big Z-💣 from @Cole_Zabowski! In the fifth inning, Anthony Servideo showed off his speed by manufacturing a run almost on his own, stealing second after singling to get aboard. He scored from second on an aggressive base-running play when Ryan Olenek laid down a sacrifice bunt. That wasn’t the first time this season Servideo’s speed allowed Ole Miss to score in a situation that would not normally lend itself to such. For the game, Servideo went 3-for-3 with two runs scored. This man has some wheels on him @ServideoAnthony scoring from second off a sac-bunt! Immediately following Servideo’s run, Grae Kessinger added one of his own with a solo home run. It’s without doubt Kessinger is seeing the ball extremely well over the past several weeks. Right after that sac-bunt run, @Swagulater15 rips one out of the park! With Ethridge’s dominance on the mound joined by the pitching of Houston Roth in the final two innings, the Rebels’ three runs scored in the first and two in the second proved to be more than enough. However, Ole Miss would add single runs in each of the sixth, seventh, and eighth innings. In the sixth, Zabowski added his fourth RBI, scoring Thomas Dillard. Dillard would go on to score Kessinger in the seventh, while Kessinger would send Servideo home in the eighth. The victory was head coach Mike Bianco’s 735th win as Ole Mis shead coach, tying him for fourth on the all-time SEC wins list. Inclement weather in the Oxford area pushed Saturday’s game to Sunday as part of a doubleheader, with each game set for seven innings. Kentucky pitching would limit the Rebel hitters to seven hits and one run. The single run wouldn’t happen until the last inning for Ole Miss. Freshman Kevin Graham, pinch hitting for Knox Loposer in the final inning, took a 2-1 pitch to right center field for a solo home run that cut into the Wildcat lead. However, there would be no more runs from the Red and Blue. Catcher Cooper Johnson was the lone Rebel hitter with multiple hits. Once again, his defensive play was outstanding. M5 | Rebs get out of the jam with a throw out at the plate! Freshman starter Doug Nikhazy was saddled with the loss and dropped to 3-2 on the season. In relief, Tyler Myers and Max Cioffi each pitched 1 ⅔ innings of shutout baseball. Sunday’s second game of the doubleheader would be winner take all for the series. Ole Miss freshman Gunnar Hoglund received the start in the critical game three. The first three innings of the pivotal saw zeros from both sides. In the fourth, Hoglund was only one pitch away from getting out of a first and third jam. Having one of the Wildcats’ best hitter in a 0-2 hole, Hoglund just missed his spot and the Kentucky hitter made him and the Rebs pay dearly with a three-run home run. Kentucky added an additional run in the fifth that put Ole Miss at a four-run deficit. Despite tying his career high of eight strikeouts, Hoglund would be tagged with the loss having given up all four runs. But true to form, the Rebels would not go down without a fight. Grae Kessinger doubled home Jacob Adams and Anthony Servideo in the fifth inning to cut the lead in half. Kessinger went 3-for-4 on the day and 7-for-10 on the weekend. B5 | Grae Kessinger doubles down the third base line and we have a ball game! Cooper Johnson doubled to lead off the sixth inning but Ole Miss was unable to score after getting him to 3rd with one out. Ole Miss would load the bases in the seventh with one out. Johnson smacked a potential game-tying hit that was unfortunately snared by the Kentucky second baseman. In the end, a strikeout would quell the Rebel threat and secure the game and series for the Wildcats. The Rebels are at home for midweek action Tuesday against Memphis at 6:30 p.m. The weekend finds Ole Miss on the road to start the second half of SEC play against Western Division opponent Auburn in a Thursday, Friday, Saturday series. Action starts at 6 p.m. Thursday and Friday and at 1 p.m. Saturday. Chris Muller is a 1995 Graduate of Ole Miss. He is a collegiate recreational sports professional currently residing in Arlington Texas with his wife of 19 years, Amber, and German Shorthaired Pointer, Sophie. Chris is an avid Ole Miss Baseball and Football fan. His hobbies include watching college football and baseball and playing poker with his friends.